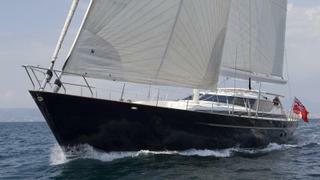 The 36.2 metre sailing yacht Sovereign has been listed for sale by Jochen Brill at Northrop & Johnson. Designed by Dubois Naval Architects, Sovereign was built in aluminium by New Zealand yard Alloy Yachts to ABS class and delivered in 1995 with a full refit in 2011. Accommodation in a RWD-designed interior is for eight guests in four cabins comprising a full-beam master suite, VIP suite and two twins, all with entertainment centres and en-suite shower facilities. In addition, there are quarters for six crewmembers aboard this yacht for sale. Access into the low-slung pilothouse is through hydraulic sliding glass doors and the pilothouse profile has been refined to provide even greater visibility when sitting in the upper saloon, and to enhance the vessel´s streamlined appearance. Meals can be enjoyed in three locations: outdoors under the custom deck awning, in the sleek pilothouse with its casual dining and cocktail bar arrangements, or in the formal saloon below where up to ten guests can be accommodated around a walnut table with free-standing chairs. Overall, great attention has been paid to the detailing, with highly sculpted cabinets and carved geometric designs that flow into curved corner posts and dramatic curved doorways. Designed as a high-performance sloop capable of excellent speeds in most wind conditions, she has a 570hp Lugger diesel engine giving her a cruising speed of 10 knots and a range of 6,700 nautical miles. Lying in Spain, Sovereign is asking €2,950,000 with VAT paid.